Twice the Fun - A Pair of Fans Love Our Books! As twins, my boys do almost everything together ... and that includes falling in love with reading their own personalized versions of The Amulet and Two Children and It! Seeing the excitement on their faces as they discovered that they were the 'stars of the show' was worth a million to me, and I just had to share the fun with you via the attached picture. We'll never forget the storys' adventures, humor, and inspirational messages (that never felt stuffy or forced -- the guys would have picked up on that instantly). Many many thanks for giving me the opportunity to surprise and entertain a pair of very tough customers. We all look forward to your next books! Rave Review for "Two Children and It"
What a book! Light shines from its pages. You have done a marvelous job updating this classic Nesbit novel. I have read all of the Nesbit's books to my children and having their own personalized "Two Children and It" is something they will cherish forever. It is difficult to find creative and worthwhile gifts that have an educational benefit while still providing excitement for the child - your company has done it! I look forward to your next novel. Accolades for "The Book of Dragons"
Thank you for a wonderful story and for making my nephew the star... It was the best birthday gift I've ever given! I'm certain that my nieces will be just as excited when they receive their personalized books at Christmas! I just finished reading your book, "The Golden Key", and I want you to know how much I enjoyed it. I bought the book for my son and daughter, but having never seen or read the book, I wanted to read it first before giving it to my kids. I wasn't sure what to expect but the story is really good. As promised, there is lots of fantasy and magic that my kids loved. What I enjoyed most is that it is a real story about believing in yourself and your friends. I think in this day and age it is vital that we teach our kids to believe in themselves and also to "think outside the box" and let their minds lead them in new directions... My kids enjoyed hearing about the Fairy Godmother and The Old Man of the Sea AND the hand shadows you included in the book presented a challenge for everyone! I had forgotten how much fun that was when I was a youngster! Congratulations on a job well done. Please let me know when your next story is available. Couldn't resist sending you this picture. It's a little blurry but it certainly caught the moment! My son Connor was so excited about his book he wouldn't let it out of his sight. 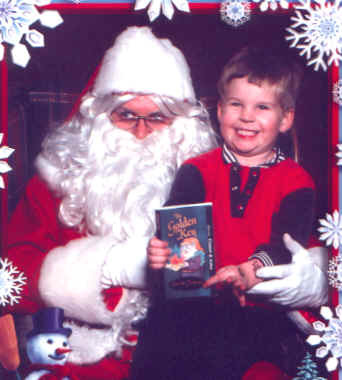 Of course Santa was a little miffed because Connor had already received his gifts (we opened presents early due to holiday travel plans) or maybe it was because he wanted his own personalized book! All kidding aside, we brought the book to the photo session because we had included Santa in the book as the 'adult' that introduces the story and it worked out wonderfully. Connor is too young to read the book himself but he loves having us read it to him at bedtime. He laughs and giggles every time he hears his and his best friend's name mentioned. We've read the book three times now and Connor still wants us to read it again! We look forward to your next book. Just a quick note to let you how much my daughter enjoyed starring in her very own story and how much I enjoyed reading the story to her. I purchased "The Golden Key" from your web site and didn't really know what to expect but I liked the idea of my daughter being included in the story. When the book arrived I was pleasantly surprised by the quality...it looked like a REAL book! I quickly skimmed the story and decided that indeed it would be something my daughter would find interesting. You should have seen her face when I showed her the book with her name on the front cover and then again when I started to read the story. It was very exciting for her!! I also liked the fact that the story was not boring for me to read to her... I must admit that I was as curious as she was about what would happen to them next and if they would ever figure out what the Golden Key opened!! It is a very clever story and it has made my daughter more interested in longer stories than she ever has been before. It is a wonderful book and I thank you for sharing it with us. I hope to see more of your folklore stories very soon.